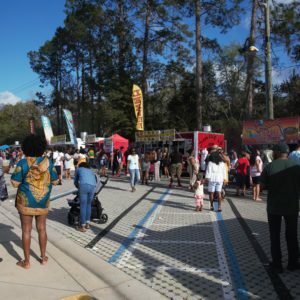 Tallahassee apartment complex, Stadium Centre, blamed its ‘partnership’ with Florida State University as the reason a Florida A&M University residents couldn’t utilize their rent leniency. Stadium Centre is an apartment complex located on West Gaines Street between both FSU and FAMU. Its website is themed garnet and gold and declares it’s ‘only steps from the FSU campus,’ although the apartment complex is of equal distance to the two universities. Stadium Centre offers a one-time deferment of rent for its residents, so that if their financial aid hasn’t been disbursed they can wait until they are able to pay their rent. Annie Moore, a FAMU student, contacted Stadium Centre a few weeks before move-in hoping to use this deferment. Ultimately, the student-oriented complex told her the deferment offer is exclusively for Florida State residents. Moore understood the partnership with FSU, but she was offended that Stadium Centre couldn’t offer her the same deferment because it didn’t know how FAMU handles their financial aid process. Moore had to rush and ask family members to help her come up with her first month’s rent. Luckily, she was able to gather the $700 she owed and, ironically, received her financial aid refund right after she paid her rent. After speaking with a front desk employee of Stadium Centre, she explained that the complex doesn’t keep a numerical list of who uses the one-time deferment, but are able to go in the system and see if a resident has already utilized it. Stadium Centre’s deferment offer can be helpful for college students. The question begs, why won’t the complex partner with FAMU when its campus is also in the area? Stadium Centre is owned by American Campus, a company based in Austin, Texas. They also own College Club Townhomes, another Tallahassee off-campus housing option. American Campus claimed its reason for Stadium Centre’s sole partnership with FSU is because it’s closer to that university and College Club Townhomes is closer to FAMU students. However, College Club Townhomes and Stadium Centre are both located 1.3 miles away from FAMU, the only difference is one is south of campus and the other is north. Both locations are valid options for students. College Club Townhomes offers the same deferment for its residents. After speaking with employee Joshua Forbes, he explained that the form residents sign is done by the apartment complex only and that there is no contact made to the school. The resident just has to fill out the form and include their financial aid information. Therefore, if the deferment process doesn’t need partnership with the school to be completed then why won’t Stadium Centre allow FAMU students to also use it? Current residents of Stadium Centre deal with the fact that the apartment complex caters to FSU. Stadium Centre is partnered with FSU, so their first priority is those residents. But, over the years more FAMU students have migrated to the complex because of its close proximity to their campus. Being that there are three large colleges in Tallahassee, apartment complexes should be open and aware to the different students in the area. Favoritism can create a divide visible by the overlooked students.